If you’re a building contractor or property developer involved with the conversion or refurbishment of existing buildings or new build projects, we can supply both your sound insulation and air tightness certificates in one, quick, hassle-free package. Feel free to contact us for a quote. Alternatively, please review our case studies to see how we can go beyond just testing and provide technical support to help you achieve your ‘Pass Certificates’ quickly and easily. Confidence – we’ve carried out 40,000 tests since 2008 so you can be assured that you’re in safe hands. Experience - in the last two years alone we’ve supplied over 3000 developments, ranging from simple Victorian conversions, to purpose built homes and apartment blocks as well as office conversions. 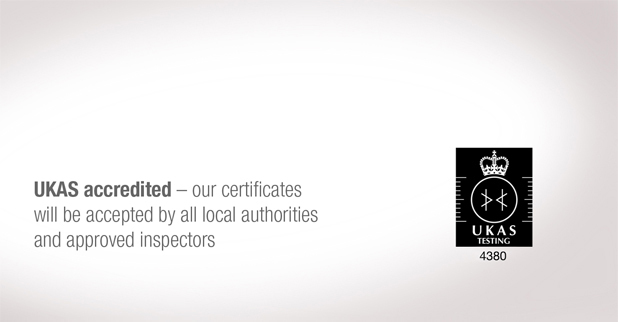 Quality - your sound and air testing is carried out in accordance with UKAS accreditation. giving you the assurance that the results you receive comply with UK Building Regulations. Speed - we aim to get to your site in three working days. 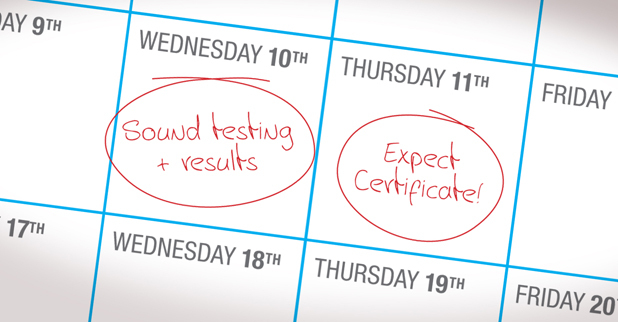 You can receive immediate on site results and a formal report one working day after the testing. Support – when you need more than just testing, we are here to offer technical advice and bespoke design solutions. "Excellent service and would 100% recommend to anyone who may ask." "EVERYTHING was really excellent. I would most certainly use your Company again and recommend it to others"
"Many thanks for the quick turn around and your seamless and effective communication throughout the process"
"Massive thank you for all your help on this! You really have gone above and beyond and your help hasn’t gone unnoticed." "I am impressed with the service you guys have provided!" "You were very efficient and we’d certainly use you again"
"I will definitely recommend site-sound in future." "The engineer is a credit to your company - Polite, organised and professional." "Compliments for the good advice from your sound engineer." "I wanted to write to you to thank you for all your help. You have been great." "I will be sure to pass your details on to future clients who may need your services." "I am confident that we will be working together again in the near future." "The engineer was very helpful and I will definitely be using and recommending your services for future projects." "I would like to say how impressed I am with Site Sound - Rather than it being a terrifying exam that we had to pass, it was a very pleasant, collaborative process with the engineer wanting to achieve a successful result." "Thank you so much for a quick response and a great service"
"Really appreciate your quick work, as always"
"Thank you for your most efficient and refreshingly polite service." "Thank you very much for the service Site Sound provided for us"
"Just wanted to convey my thanks for your expert advice questioning the requirement for an air test. It is that kind of honest feedback that will ensure you are recommended time and time again"
"We will be sure to be in touch in the future on any building works we undertake." "I would definitely recommend you guys and should we need another property tested I will get in touch." "We will have no hesitation on using your services on our next project"
"Hats off to your guys for another good job"
"Site Sound have been amazing"
"Thank you for the time you took to make sure all went well"
"Thank you very much for your professional service and prompt assistance in providing the tests inspections." "I would like to take this opportunity to thank you and your site teams for a very professional service in dealing with this site under difficult circumstances." "Thanks for getting this done so well and rapidly. Your engineer was very helpful and professional." "Thanks for the excellent service, I’m sure we will be working together on the future projects." "Efficient booking, right price, on time, polite engineer, report on time … the service could have not been better"
"It was a pleasure to work with your company." "Excellent service by email and on site." "I wanted to thank your team for being so helpful on this job. It’s been a pleasure working with you again and I’m sure we’ll be calling soon for the next project." "Many thanks for the service - impressed!" "Please can you thank your engineer for all his help - especially for the time he spent talking to our neighbour. I’m sure that speaking to an expert has helped her to see the reality of the situation." 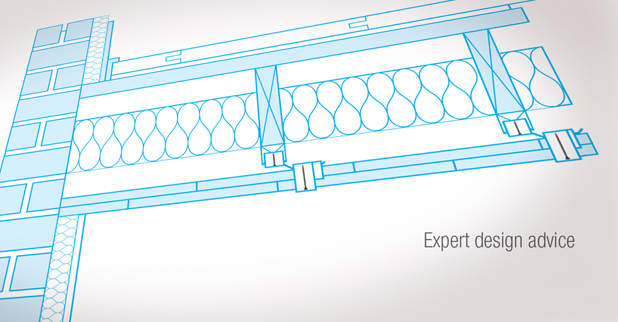 "Your engineer was very patient and thorough in explaining everything to us." "I found you to be very prompt and efficient." "To be honest throughout the service provided by your company has been perfect and I will use and recommend you again"
"Thank you very much for your quick service"
"I was very pleased with your service on the last project we worked on so I've recommended you"
"Your engineer was great and very helpful." "Would like to thank your sound engineer for his professional advice following the first failed attempt"
"Thanks for such speedy service, I will definitely be using you next time and will be putting your name forward to people I know." "We would just like to complement your engineer. He kept everyone informed of what was happening & also helpful towards the guys on site." "Thanks for a great service in the lead up to the tests and for the service of the engineer on the day who was exceptionally helpful." "Thank you very much for a fantastic, efficient service!" "Great working with your company." "I will be sure to use your company again for any future projects and I will put the word about." "Thank you so much for an excellent service and sure we will be using you in the future"
"This is by far the best experience I have had so far for sound and air testing." "I have been most impressed by your team and we hope to be able to use you again." "I was more than happy with the overall service and the professionalism shown by your engineer in the way the test was handled." "Service excellent throughout and would use the company again"
"Thank you for your quick efficient service." 24 June 2016 Branislav Martinovic Warren Oak Construction Ltd.
"Your service was so much better than a firm I approached prior to you and was the one which my local authority recommended!" "Many thanks for your help and assistance on this project, you and your staff have been very professional and informative." "The technician's conduct on site was very professional and incident free." "I found the cost competitive and the speed with which you reacted to our request was as good if not better than any service provider that we have dealt with recently." "We will definitely look to work with you guys again." "Thanks for being so efficient dealing with this matter for us"
"From the office admin to the site work you have provided a very good service." "Excellent. See you on next one"
"Provided us with excellent service from their admin team through to their punctual, knowledgeable engineer." "Very impressed with your inspectors knowledge and professionalism." "Great service, helpful advice and the company was very easy to deal with"
"Very impressed with the speed of getting an appointment and the getting of the results"
"Brilliant engineer, I will be in touch in the future as I have 3 more sites on the go." "Would like to say your man did a brilliant job"
"Just wanted to thank you and the team for an excellent service." "The whole process has been very well managed and has been very competitively priced"
"Your engineer was excellent in every aspect, he was punctual, very helpful and gave us very good advice and we will definitely be using you on our next project." "Thank you for the excellent customer service, it was a real pleasure to deal with such a helpful person, and the test engineer who was really friendly, professional and patient." "I found the cost competitive and the speed with which you reacted to our request was as good if not better than any service provider that we have dealt with recently"
"What could we do to improve our service to you? - Don't do anything , your service is an excellent Business Model, wish more companies were like this." "I was very happy with the service and I would be happy to recommend you to other people." "Thank you for your very efficient service. I ‎just wish there were more of you out there!" "An excellent service! Would recommend you guys without hesitation." "I have completed around 12 sound tests in the last 12 years and never been happier. I will not use anyone else"
"Great satisfaction with the courteous professionalism exhibited by your organisation"
"We very much appreciate all your helpful assistance in this matter, and we look forward to instructing your very professional services on future projects." "I spoke to around 5 different companies trying to arrange a sound inspection for my property. None of them were as competitively priced, helpful or generous with their time and advice as Site Sound." "Site Sound carried out tests for my development and I would like to say how the engineer arrived on time and at an earlier time than usual in order to allow our business to open at 9:00. His attitude was very professional and helpful in explaining the procedure that that would be gone through to carry out the test. The test was witnessed throughout and explanations of the results was given at the conclusion of the test. I found the company very competitive and would highly recommend them and shall certainly call on them in the future." "The engineer this morning was very professional and I was very happy with him." "We are both very happy with the level of the excellent service that was provided and would recommend your company to others." 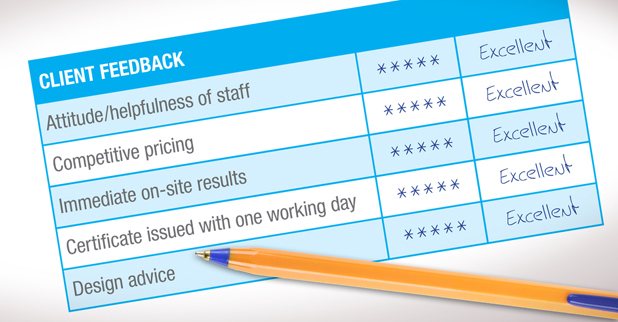 "Service was faultless; no improvements possible." "It was all excellent, the engineer gets top marks!" "Once again thank you and i am happy with all your sound testing services we will meet up very often in the future projects I have already recommended you to one of my best friend's contractors"
"Thanks for all your help and dealing with it so rapidly. Have been very impressed with the service and will definitely use your firm again and recommend." "Your engineer was very helpful & professional and as always it has been great dealing with you. You are at the top of the list for sound and air testing, and I have already recommend you to a couple of other friends who also do this sort of work"
"I was very happy with all the service and will contact you when we are ready with the next two we are building at the moment"
"Great service from everyone we dealt with so thank you all. A fine example of how companies should operate to ensure repeat business." "Thank you for a fantastic service start to end." "I was very happy with the service provided and have indicated as such below"
"Thank you very much for your great service, you and your team have been very friendly and professional. We look forward to working with you again in the future." "It has been a pleasure working with you and I look forward to the next project." "Very quick and efficient - You are the A-Team!" "The experience was all good and appreciated your flexibility"
"The whole service from my initial call, to the site visit through to the report has been excellent. Everyone I spoke to at Site Sound was professional and knowledgeable." "Thanks for being so helpful with the air tightness testing." "We've been happy with the service received from Site Sound and would recommend it." "Keep up with the excellent service that you provide, remain as competitive as possible, I must say I thought your fee for the sound test was very reasonable. One last thing in my opinion the engineer conducted himself very well he was very informative, helpful and professional, being an employer myself I would be proud of him and the way in which he represented the company." "Seriously man - you’re a legend. I owe you a few beers or something, as you have done so much for me after your initial consultation." "Many thanks for your speedy and efficient work." "We would just like to say that we are impressed by your turnaround"
"We have received the sound test and would like to thank you for the prompt professional service you provided us . We will have no hesitation to recommend yourselves to our colleagues ." "Thanks for being your normal super efficient self, and i am sure we will be speaking with you again soon"
"You are good guys to deal with - you were very helpful and will use you when next needed." "May I take the opportunity to thank you for the professionalism of your company. We would certainly come back to you in the future." "Would like to say thank you for the attendance of the engineer yesterday, very professional and helpful approach." "Thank you very much for everything you did for me. You are the most fantastic company representative I've come across in recent years. I hope that your boss value your great work as much as we costumers do." "Site sound .. Punctual , easy straightforward booking , engineer arrived , got straight on with the job, they give advice & tips on materials that would help in your property succeeding through with your sound test if required.... We would recommend and use site sound again in future...."
""Very good service and advice!"" "1. Engineer arriving on-site at agreed time : Excellent ....... arrived 10 minutes early 2. Attitude/helpfulness of engineer on-site: Excellent ....... sensitive to the needs of all parties 3. Attitude/helpfulness of office staff: Excellent ..................... AAA+ Service and information"
""What could we do to improve our service to you?" "Absolutely nothing. A very professional; quick, and value for money service""
"You guys have responded to this with the utmost professionalism; I wish there were more companies like yours." "Thank you all for your quick and very good service." "Many thanks for your excellent and efficient service, please see completed questionnaire below. I have no hesitations to recommend you to colleagues and use your services again." "From start to finish the process was smooth and ran perfectly! Thank you very much for your service." "We are very satisfied with your service. We will be using you again in the near future." ""Thank you for your cooperation. I am impressed and very happy with your excellent service. Quick respond, value for money and helpful staff. From now on I will be using your company only."" "Both Dave and I are really happy with the service you provide. If only all our consultants were as helpful as you, our jobs would be a doddle!!" "Barry, really nice to have met you today and thank you for all your help and support. I will get my other clients to contact you.Or I will organise it myself." "Thanks Mike, and thanks for the good service." ""Thanks for your mans advice on site regarding how to further improve the sound insulation - very useful""
""What could we do to improve our service to you? " - Nothing - Excellent Service keep it as it is." ""What could we do to improve our service to you? " - Everything was well done." "Your service is excellent, the engineer arrived early, carried out the test without any fuss and we would definitely utilise and recommend your service." "We needed to get things done fast and I think between us it could not have been done faster. Very very happy with the service on site and communication in the office." "What could we do to improve our service to you? "nothing - all great""
"Did exactly what we wanted, much faster than anticipated and a better cost than we expected - a truly fantastic service! It’s nice to actually deal with a company that exceeds expectations"
"Just a few words to thank you for your wonderful service. We will certainly be recommending you to anyone who needs a sound test. In fact I have done so already. We will be contacting you when we need your services again." "Thanks for your help at Wantage. When I spoke to you we were at a dead end with our existing sound engineer that had been recommended to us by our architect. He came up with an expensive system that was not needed. Following our initial telephone conversation, and your site visit we've been able to simply find a way to meet the standards needed for the conversion and save money. Very pleased and thank you." "“We could not fault your company in anything, the engineer called to let me know that he was ahead of schedule, he did not disrupt anything or anyone, was very professional and efficient and yes I will recommend your company to my colleagues and I will use your company as and when I need it. I do not really see how you can improve the company! Well done, if only every company was as efficient and professional as yours, please pass this on to everyone that was involved.”"
"Thank you for sending these documents. You've been a great help to us. I will ensure I keep your details for future work." "All the service and advice that I have received from everyone at Site Sound has been nothing but outstanding." "Thank you for the speedy and professional service. I look forward to scheduling in the final tests with you upon project completion. In the meantime if any further projects come around in need of sound testing, I'll be sure to get in touch with you." "I am very pleased with the service, particularly the pre-test liaisons with both the client and building inspectors, as well as myself. In view of this I would not hesitate in recommending your services to others in future." "“I would like to thank you for such a speedy response and add that I would highly recommend your company in the future, as I found it to be a very prompt and professional service and a pleasure to deal with.”"
"“We cannot fault your service which was first class.”"
"Great service, arrived on time and did everything as explained - Excellent"
"I will certainly be using them on future projects and would not hesitate to recommend them in the slightest to anyone else.”"
"“Frankly I am not sure you could improve your service – your initial response was possibly quicker than a 999 call and your personnel’s clarity in explaining the intricacies of audio science to me (someone who views it akin to Chinese algebra) was exemplary. Very, very impressed. Thank you”"
"Thank you for this report which is a stellar example of someone doing his job right. The instructions are very clear and the background situation is very well rendered. If I ever need a sound engineer you will by my first choice." "Thanks very much for turning that around so quickly. I will spread the word!! it's not often I come across companies that come up with the goods!" "Good experience all round, thank you"
"Thank you very much for your fast and efficient service. I would also like to say that Alejo was a very professional and very pleasant person to deal with. I was very pleased today during and after the test." "I paid your invoice today - thanks for everything." "When my wife telephoned your company to enquire about a sound test, she was very impressed from the word go with the efficiency and helpful and informative way her query was handled. We were delighted that you were able to do the test so quickly. Your engineer found us and arrived on time, conducted the test efficiently and we had the results immediately. 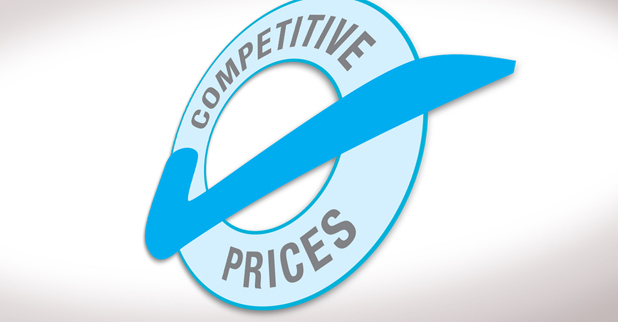 We thought the price was competitive and the paperwork arrived when you said it would." "“I'm delighted that the specification that your firm provided has enabled success in the sound test and for all of the advice along the way. The tester was a thoroughly decent chap as well, arrived on time and fully explained the process and results.”"
"Would you recommend our Company? Yes"
"“Many thanks for the report and the very prompt, friendly and helpful approach from everyone at your company.”"
"“It has been a pleasure working with you and I will do my best to spread the word.”"
"I must say you and your company were a pleasure to deal with: Responsive Efficient Professional Polite"
"“I really couldn't fault you from start to finish.“"
"“We couldn't fault the service you provided in any way, the initial response and quotation was very quick, together with a speedy service once we had instructed you to proceed. We will definitely use you in the future should the need arise and would not hesitate to recommend you to others.”"
"“It was a pleasure dealing with both you and Mike. Thank you both very much indeed for your kind assistance. Will definitely recommend your service.”"
"“Many thanks for the testing, it all went very smoothly and efficiently.” Finally, what could we do to improve our service to you? – “No improvements required from my point of view, I’m a satisfied customer thanks.”"
"We were delighted with all aspects of the operation and would give excellent across the board. We would definitely use your company again and would not hesitate in recommending your company." "I would like to say a big thanks all at Site-Sound for carrying out the required building regulation impact and airborne at our dwelling spit on a residential property in maidstone kent. Apart from being very reasonably priced! . . . from first point of contact everyone was extremely friendly, efficient and informative of what would be done/how. When they arrived on site after liaising with our building control on our behalf they we very accommodating to tradesmen/women carrying out the works on the day plus quickly and in a clean manner. I will certainly be using them on our future property projects and would not hesitate to recommend them in the slightest to anyone else!" "I must say you and your company were a pleasure to deal with: Responsive,Efficient, Professional, Polite"
"I cannot emphasis enough what a pleasure it has been to deal with yourself and with your company, please thank everyone involved on my behalf. Well done all of you nothing need improving, keep up the good work and I am sure that at this rate you will be rewarded. I wish half the companies I deal with were as efficient and professional as yours." "“Site-Sound provided a very user friendly and professional service & I have already provided contact details to colleagues and friends in other businesses”"
"Thank you for your service all our work is completed and happy with your service Simply the best will use again and recommend to others." "Thank you for the confirmation that the sound tests passed, your engineer on site was very helpful and patient when waiting for site operatives who had to get into the café which we are still using as office space."